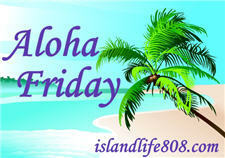 I’m sitting here trying to come up with a topic for my Aloha Friday post, but I’m drawing a blank. So I’ll make that my topic! It can be tricky to come up with post topics day after day. Oftentimes, I’ll find myself not knowing what I’m going to post about right until the very end. Other times, I’ll have so many post ideas that I don’t have enough days to post them all. Oh, yes. It usually means I need to step away from the laptop and live a little for inspiration. Yes. I read a book. A good book always motivates me. oh sure i get bloggy writer’s blog but then i just distract myself for awhile with something else and then go back to writing. thank goodness it always passes! yes but lucky for me I do a lot of reviews and giveaways so I just do those until I get past it. Read the news or read a book, work on something non blog related. If I have one, I tend to just take a few days and not blog…. Yes, as a matter of fact, I’m having it now. When it happens I usually just take a little break from blogging. To be honest, I don’t do anything, I just wait until I have something to say again. I search the news outlets. Yes and I usually just don’t blog that day. I pace, google search, pace some more, play a game, pace a little, sing off key, pace, do half-yoga/half bad dance moves, pace for awhile…then bang my head on my key board and start typing. I don’t have my own blog as yet so I’ve not had problems with bloggy writers block. A blog is at the planning stage; simply a problem of finding the time. But generally I don’t suffer from writer’s block, which I think is a problem of focus. Possibly your blog is too wide-ranging and you need to concentrate on just one or two topics.